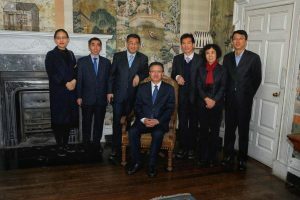 We were delighted to welcome a Chinese delegation led by Vice Governor He Tiancai of Shanxi Province this morning as part of a 2 day business visit to Dublin and Mayo.ie Local Enterprise Office. They especially loved visiting our Chinese Room and finding a dresser originating from their own province at home! After having a wonderful overnight stay in Hotel Westport, they were welcomed to Westport House by Owen Hughes. 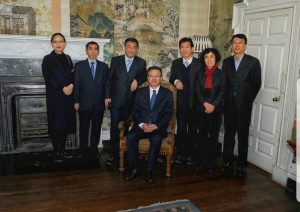 Owen outlined Portwest’s production facilities already in existence in China as well as the tourism potential of Westport House and Hotel Westport in China. 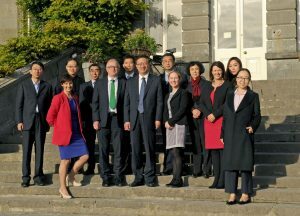 Pictured include representatives of the Chinese delegation, tour operator Rachel Sunshine, Glen Keen Farm, Westport House & Hotel Westport. 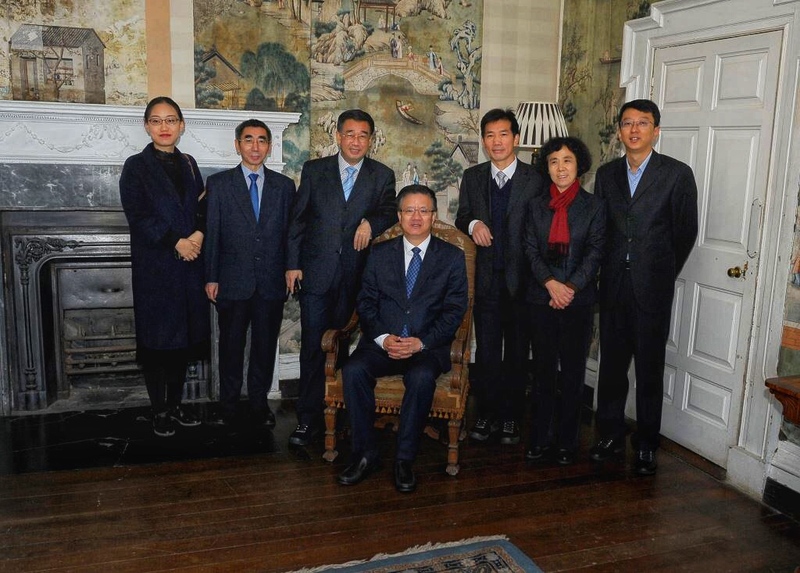 A Chinese delegation led by Vice Governor He Tiancai of Shanxi Province enjoyed the Chinese Room during their visit to Westport House on Friday morning – even more so for finding a dresser originating from their own province. 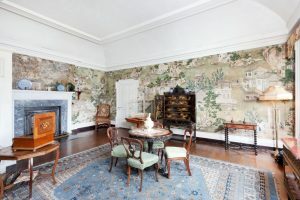 The Chinese Room is one of the most significant interiors in Westport House. 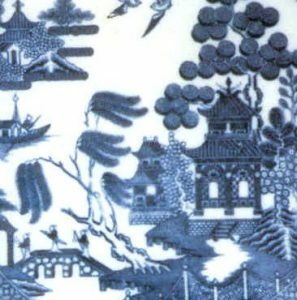 It’s significance rests on the very fine Chinese hand-painted wallpaper based on the story of the Willow Pattern (see below for more information). The room was decorated in 1778 or soon thereafter. This interior has been attributed to James Wyatt, who designed the large dining room. Wallpapers were manufactured in production-line workshops much like decorated porcelain and paintings. Working to a copied design and with labour divided according to skill, a team of painters would produce sets of wallpaper to decorate entire rooms. 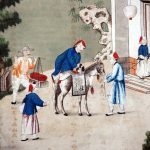 In this case, the wallpaper depicts lake scenes, terraces, courtyards, figures and domestic pursuits and others returning from fishing and playing games, painted in brilliant and naturalistic tones on a pale green background. There is no repeat pattern and so the room represents one large painting. On closer inspection, mustaches can be seen on some of the characters on the wallpaper – these were added by the children of the house! This tells the story of a lovely Chinese maiden named Knoon-shee who fell in love with her father’s secretary, Chang, but was commanded by her parents to marry a wealthy rival suitor. She refused and her angry father locked her up in a little house just visible on the left of the temple. From here ,she continued to send a message to her lover ‘Gather my blossoms, ere it be stolen’. Chang succeeded in entering the apple orchard and carrying off his beloved and so we see them hurrying over the bridge. Koon-shee with a distaff and Chang carrying her box of jewels followed by her angry father with a whip. The lovers escaped into the ‘little ship sailing by’ and landed on the island, which can be seen on the left of the picture where they took refuge in the little wooden house. The father and discarded suitor tracked them down and set fire to the house while they were sleeping and so the lovers perished.